It sure looks nice but the side rails are very high and not very wide. I think your going to have flexing and twist when your cutting. 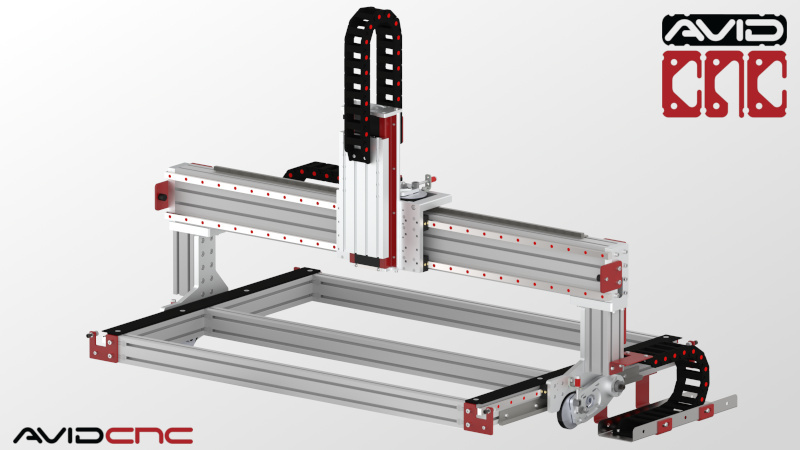 Most builders use 3 inch or 4 inch square extrusions or metal for the side rails or Y axis. Look at some of the commercial builds you will see what I mean. Maybe all your going to use is a small hand router for spindle, if so you will be ok.
side rails are very high and not very wide. I think your going to have flexing and twist when your cutting. Hi wmgeorge, do you mean the machine frame's side rails or the x-carriage side plates? The spindle is the standard Chinese 80MM 2.2kW spindle. You are welcome to utilize any parts of the design for your personal use. Last edited by davida1234; 02-24-2019 at 08:34 PM. Last edited by davida1234; 02-24-2019 at 08:35 PM. My Saturn 2 from FLA has 3 inch square steel welded. Thanks for the input. The Saturn is one of my all time favorite designs and, admittedly, was a starting point for my design. I did the side rails with 3030s first and still have them. But the machine being a test mule, also built the thinner ones with 1530s, thinking that the 3030 looked so massive. Want to explore if the thinner frame will support the side loads. If I get any flexing or twisting, I will revert to the 3030 frames. I would go back to the 30x30 now because once you get it running it will be so much fun you will not want to redo then, I have cut and routed some 1/2 and 3/4 MDF and besides being dirty its tough but it carves so nice. I have done 2 inch thick walnut live edge slabs and it takes all the Hp I have to get it turned into a nice planed finish. I have a decent dust collector and would not cut without it with the MDF. The rest of the machine looks very nice! wmgeorge, thank you for your encouragement. The machine is already 3/4 built and I built it for testing. The thin side walls are built with a shear panel inside which is permanently attached with ss anchors and FRP in the channels. I want to particularly test how they will perform as it will reduce the width by 3". I will need all the help I can get from you and everybody else with the electrical and setup because that's where I am pretty clueless. With the X-Axis and Z-Slide finished, it's time to put that assembly on the gantry! Attach the lower plate to bottom rail blocks as well. X-Carriage and Z-Slide is on the gantry! Last edited by davida1234; 02-24-2019 at 08:36 PM.